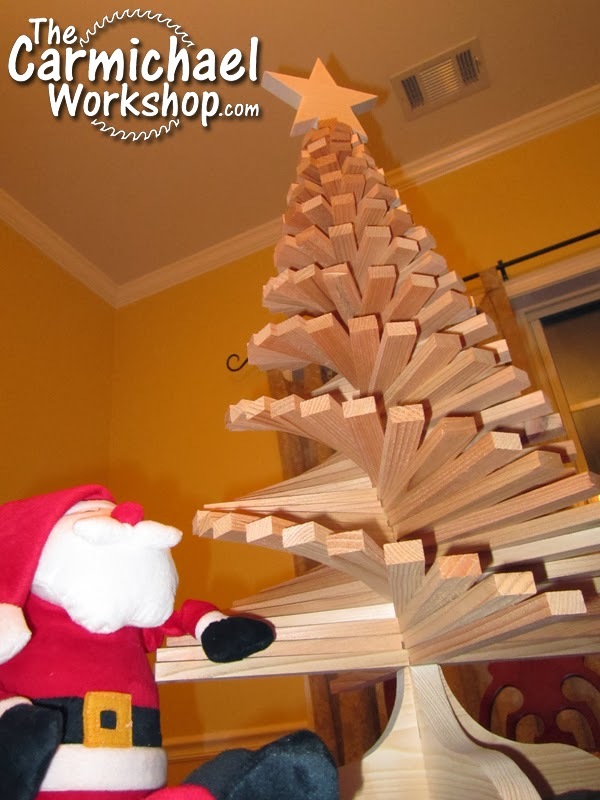 Share the Gift of Woodworking this Holiday Season! 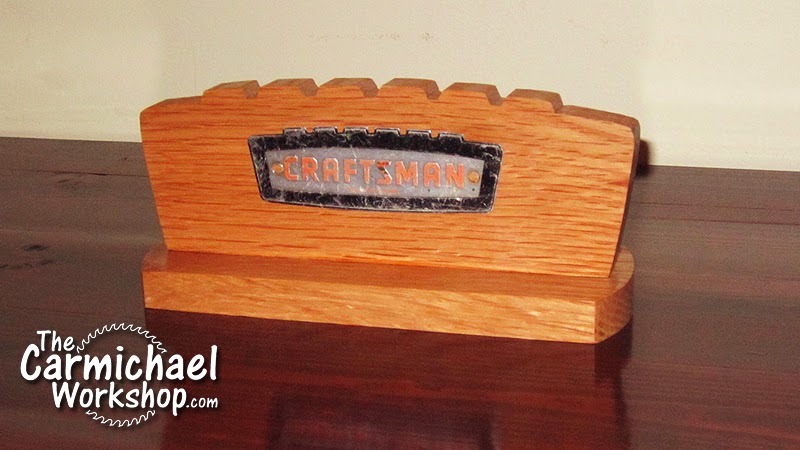 When was the last time you showed somebody how to do their first woodworking project? The holidays are a great time to share the gift of woodworking with a relative, friend, child or neighbor. For a lot of us, woodworking is a solitary thing and we spend most of our shop time alone. Try inviting someone into your shop over the holidays and help them make their first project. 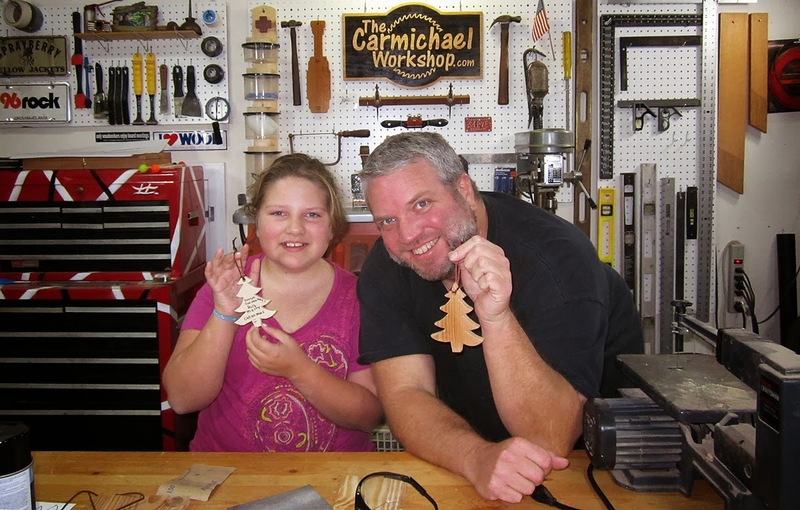 This evening I taught my 11 year old daughter how to use the scroll saw to make a simple Christmas ornament. Of all my tools, I feel most comfortable starting a child out on the scroll saw. We searched Google Images and she picked out this Christmas Tree. 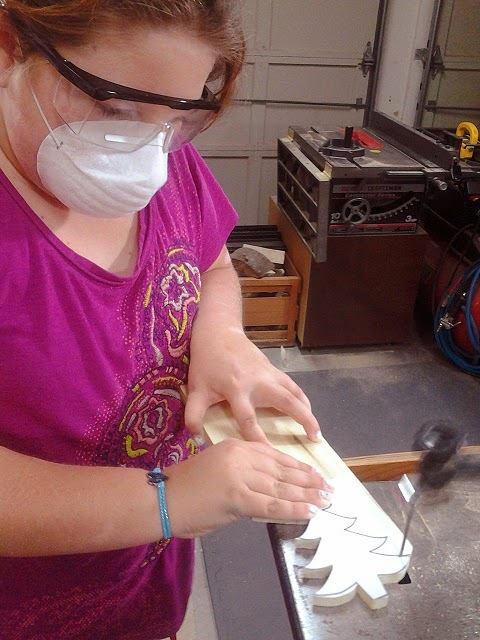 This was a great choice because she got to drill a hole and learn to cut curves, plus there were no interior cuts to complicate matters. She was able to cut out the whole project and sand it herself in about 30 minutes.  So take the time this holiday season to share your love of woodworking with someone. As always, use good judgement and make sure to teach good safety practices, especially when working with children and newbies. Happy Holidays and Happy Woodworking! 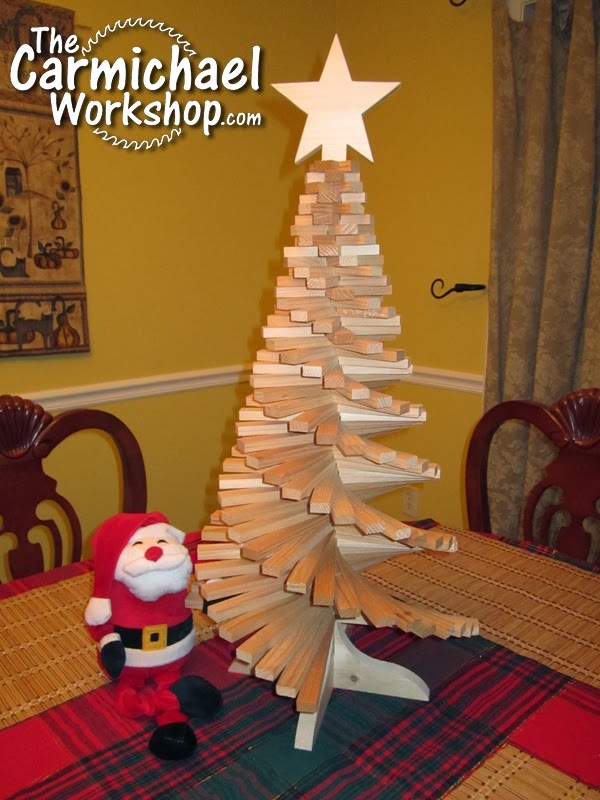 Twisted Christmas Tree - A Holiday Woodworking Project! My initial plan for this project was to make a full size wooden tree. But as usual, I didn't think about it far enough in advance to give me enough time to make it. 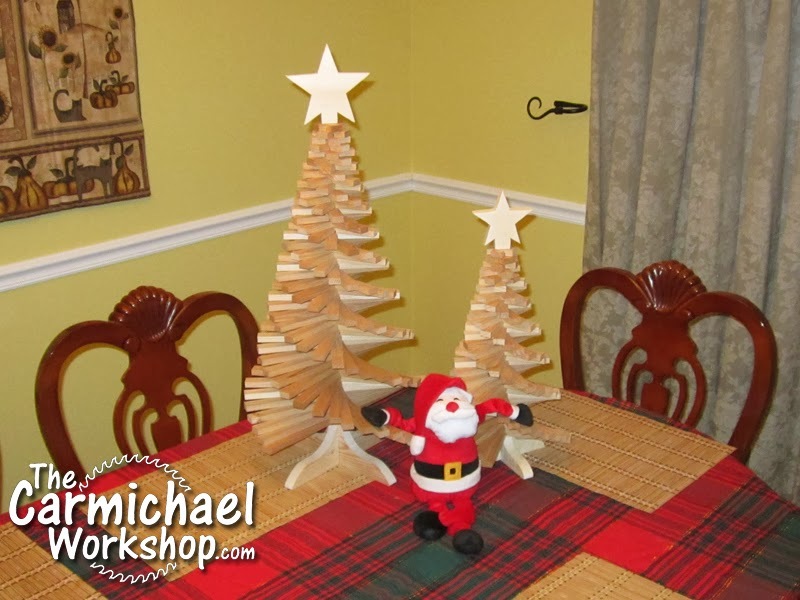 So, I ended up putting up our old tree and making this wooden table top Twisted Christmas Tree. It's made from old cedar fence boards that my father-in-law replaced, so I had to work around nail holes. I planed them down to expose the fresh wood underneath the gray weathering. Then I cut the boards into 14-1/8" lengths. I ripped those into 3/4" strips and cut them in pairs from 1" to 14" in 1/4" increments. Each piece yielded two pieces of the tree. The extra 1/8" in length compensated for the saw blade kerf. I cut half-lap dadoes in each pair of tree branches so they would overlap in the middle and drilled a 3/8" hole in the middle. I mounted a 3/8" dowel rod into a base and slid the branches on from largest to smallest. I cut out a star and drilled a hole to mount it on top. I used no glue or fasteners on this project so that I could disassemble it for storage. I left this project unfinished because I liked the smell of the cedar - like a real Christmas tree. This was an easy project with lots of repeatable cuts that go a lot faster than you would expect, so give it a shot. I had extra pieces left over so I made a smaller one for my favorite mother-in-law! One of my father's old Craftsman toolboxes from the 1970's was just too far gone to save. The piano type hinge on it had rusted together and deteriorated so bad it was unusable. I thought the logo looked cool, so I drilled out the rivets that were holding it on and kept the logo in a drawer, then I scrapped the toolbox. I had forgotten about it until I saw a picture that Joe Ness of Ness Customs Wood Work posted of a Powermatic logo he mounted on a wooden stand. Thanks for the great idea Joe! I went to Harbor Freight today to use a 25% Off Super Coupon and a coupon for a free LED flashlight. Something about that Harbor Freight smell makes you feel like you're a man in the right place. My guess would be that the smell comes from the tires or oil coating on tools in the store, but I have a theory that they purposely pump the store with that mechanical aroma to make you feel like you should buy more tools, like popcorn in a theater. I'm not sure if the right word is smell, aroma, scent, or bouquet, but no other place smells quite like it. With my coupon, I purchased a Sanding Belt Cleaner and it works like a charm. I thought it might double as a Harbor Freight scented air freshener chunk, but it doesn't. It has a 5-star rating and I highly recommend it. I felt like I wasted a perfectly good Super Coupon on a $6.99 item, but I was happy to find this little woodworking gem and walk away with a free flashlight and a little Eau de Harbor Freight on my clothes. When I arrived home, another Super Coupon was waiting for me in the mail. Score!